Your author with a hard-earned dandy. In angling, there are a lot of things to follow, a lot of ways to organize your month or year or decade on the water. Some follow the bugs. Others the seasons. I myself have been chasing a passion. I’ve got a fever. And the answer isn’t more cowbell. It’s more musky. During my last musky trip (those meditative 70,000 or so casts that didn’t produce a fish), I put a little thought into why someone might want to take up musky fishing and have come to the following conclusion. Musky fishing is a cure for excess. Maybe you’ve got too much time on your hands. Your S.O. left you for a golfer, or your bird dog has gone on point in the great beyond. Whatever the case, you’ve got some time in your day and you’re looking to fill it with happy pursuits. Well it just so happens that a musky eat, whether a streaking slash or an epic role or an unseen churn deep down in the darkness, is a jarringly happy pursuit indeed. But it will cost you. By my last calculations, the going rate for a move is 500 hundred casts. An eat is 1,000. And a fish to hand is going to cost you in the neighborhood of 3,000 casts. In other words, that empty schedule of yours just got real full real fast. Fly tying bins overflowing with stuff? Not if you take up musky fishing they aren’t. For the last few years I’ve been that guy proudly proclaiming that he has enough tying materials to last the rest of his days. My deerhair bin in particular spoke to the power of clearance sales and maniacal midwinter tying binges. What I now know is that it was not any sort of inner madness in me doing all that buying–it was the as yet unhatched musky hunter. Now the hairless picks of deer tailbones pile up in the corner of my tying room like its some sort of burial ground, and I’ve brought home my first fresh batch of hair in years. That new cologne I’m wearing these days? Deer derriere and borax. Maybe you’re really lucky and have just too much cash these days. You won a scratch-off, got a huge raise, or inherited a fortune from a secretly rich, secretly munificent aunt. 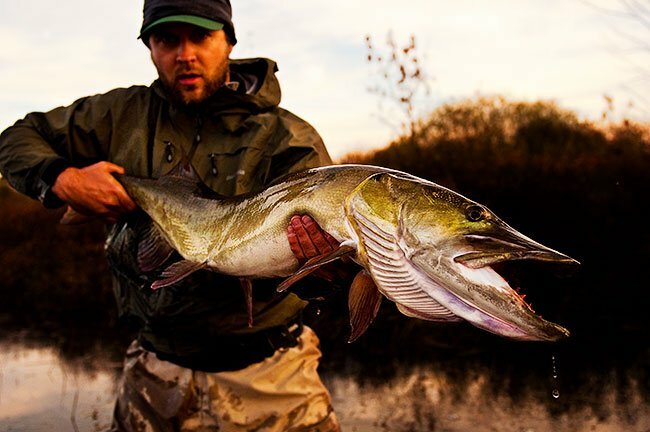 If money’s burning a hole in your pocket, musky fishing can help you squelch some or all of that heat. Ever spend $200 on a mass-produced net? Or $70 dollars for 25 yards of tippet? That’s the going rate for 110lb fluorocarbon these days. Whatever you’ve got left over you can spend on musky flies, which will run you $15-$20 bucks a pop. And no, tying your own won’t save you–not when you’re spending $2 per hook. Last but not least, maybe you’ve just got too much actual body left. You didn’t play sports as a kid, and as a result have way too much range of motion in your rotator cuff–not much to proudly whine about during war-wound talk at the bar. Catch up to your creaking, wincing friends faster than you thought possible with a few weeks of musky fishing. Fish them year round and you just might be the first in your circle to require Tommy John surgery for casting. Now those are some bragging rights. He just might have been talking about muskies.